Don Papa refers to Dionisio Mabgbuelas, or Papa Isio for short. Living during the second half of the 1800’s Papa Isio was a “Babaylan” — a healer or shaman in the local Filipino dialect — who was instrumental in the Philippine Revolution. Since the company was named after him, it will not be surprising that Don Papa Rums are made in the Philippines, or, more specifically, the island of Negros Occidental. This island has always been the sugar-cane capital of the region, and where you find sugar cane you find Rum production. 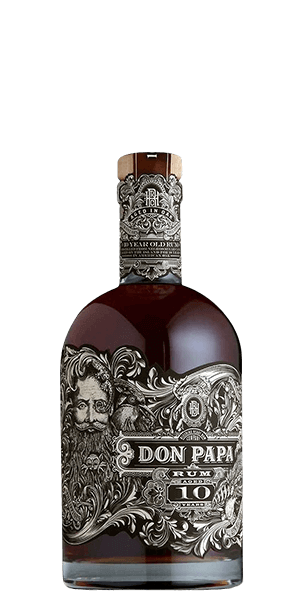 Don Papa Rums are sold and distributed through their Bleeding Heart Rum Company subsidiary. Don Papa released their 10 Year Old Rum at the end of 2014. The core Don Papa Rum is 7 years old, but they started holding several cases back each year to launch the 10 year old as a super premium offering. And since the Philippines has one of the highest angel’s share evaporation rates during aging, the result is a very dense, almost thick Rum that could pass for even older than it is. It’s like dark magic. And all that aging is done in re-charred Bourbon casks, so you get just a hint of influence from the previous spirit. Big, bold, and powerful. What does Don Papa 10 Year Old Rum taste like? The Flavor Spiral™ shows the most common flavors that you'll taste in Don Papa 10 Year Old Rum and gives you a chance to have a taste of it before actually tasting it.